[New Game Review] Roboto Brings High-Quality Cel-Shading To Android In A Fun Platformer: Who's Ready To Hoverboard? 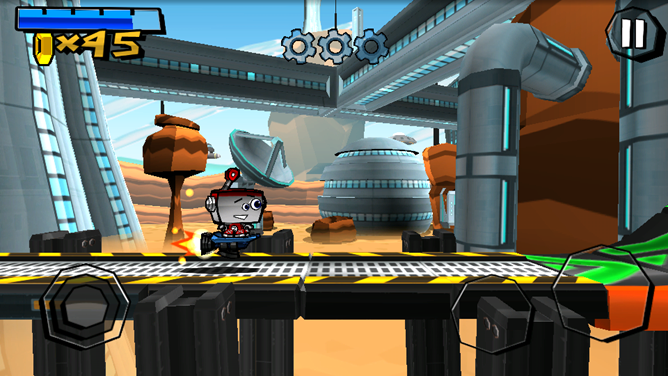 Platform games seem to be in short supply on Android. Aside from a few standouts (like Replica Island), they don't seem to be the type of game one equates with success on a mobile platform. They usually have trouble combining tight controls, fun concepts and longevity into one package. 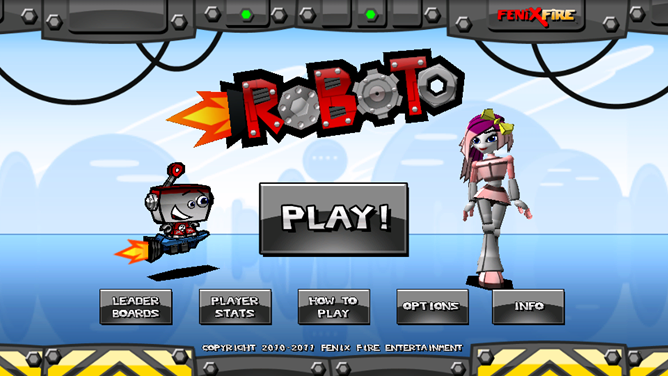 However, this game, Roboto, looks to change that. Coming at us from developer Fenix Fire, Roboto tells us a story about a teen robot (above, in blue) in love, who is trying to find his way to his sweetie to... do whatever robots do. 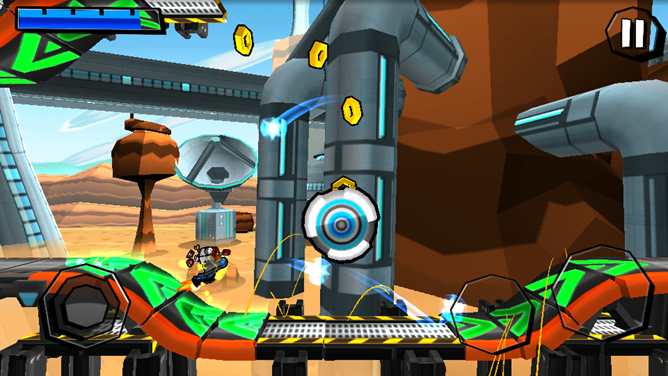 The robot traverses levels through his hoverboard, defeating enemies and bosses along the way. 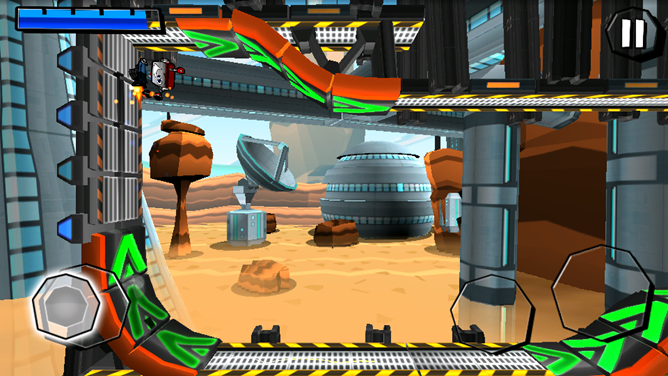 The gameplay takes place on one of several levels, which are in turn connected by a hub world. These worlds are actually well-themed and thought-out, giving you a couple good environments to go through. 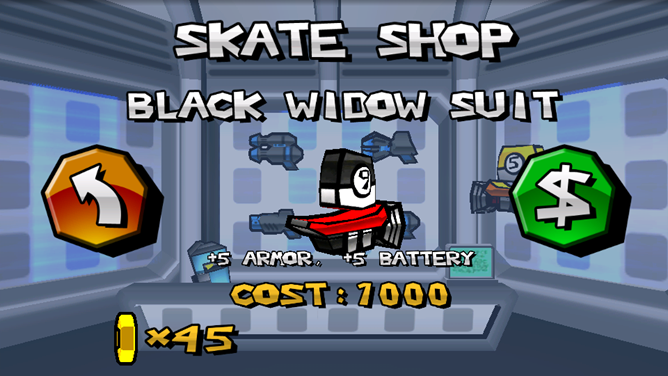 Also included is a "skate park" hub, where you can access an in-game shop to improve your character. I found this almost by accident, as the ability to improve wasn't exactly evident. However, it's nice to see a little bit of depth has been added past "complete the levels! get all the gears!" 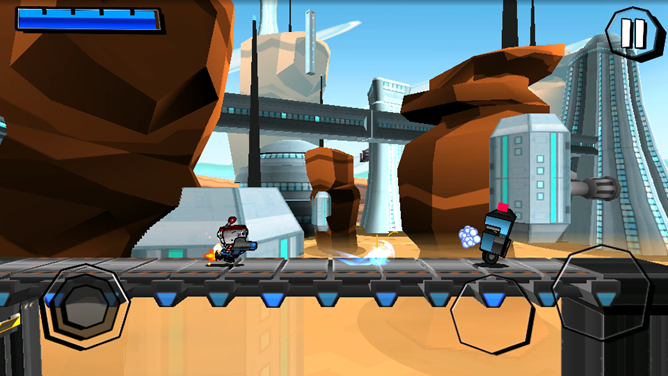 In game, you're given a simple set of standard platforming controls: a joystick to move, and two buttons to jump and fire your weapon. Collecting blue orbs fills your fuel meter (allowing you to fire your gun and hover for short distances) and collecting gears allows you to spend them as currency in the shop. Controls are snappy, but I found myself losing control of the joystick every once and awhile due to my finger slipping off the "sensitive" zone. While this can take some self-discipline to correct, it is doable; however, I'm a fan of games that let you "drag" the joystick with you once you hit the edge. This game also suffers from another platforming quibble in that sometimes it's difficult to have a measure of precision. 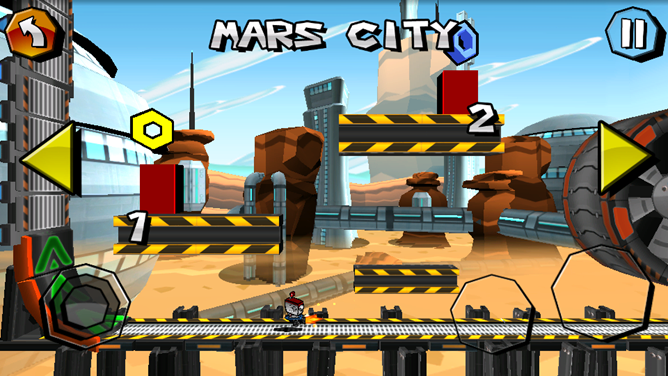 Perhaps the hoverboard's iffyness is part of the setting, but a platformer should be able to platform well. While this isn't a big deal in most of the levels, there are some portions where you'll wonder whether you missed that ledge or the game's engine made you. My only other complaint about the gameplay is the lack of orientation one can have during the upside-down portions; I know this is kind of the point, but the transition to right-side-up and back again just seems a bit more jarring than what's been done in the past. It doesn't hurt that the purple inverting rays that switch your orientation are very easy to trigger, leading to accidental deaths. What surprised me was the quality of the cel-shaded graphics, which definitely take advantage of your phone's processing power. There are also some great cinematics that definitely look a step up from most games that use them. The art style combined with the collecting aspect really evokes thoughts of the Banjo-Kazooie games for the Nintendo 64; while the worlds aren't as open, there seems to be that same feel-good atmosphere here. I do have to point out that while your love interest is a humanoid robot that looks similar to an actual person, your character and the enemies you face are more super-deformed. While a little consistency would be nice, it's not something that seriously hobbles the title. Objects in the game behave extremely well with the physics engine that's been implemented. Swinging platforms and other objects really feel like they have weight to them, and aren't just floating aimlessly. Ultimately, I'm surprised at the overall quality from this game. There has obviously been a lot of time and work put into it, and it really shows; if you can afford Roboto and your phone can run it, I would heartily recommend it [Editors note: it works wonderfully on tablets, as well]. The single-player experience harkens back to a time when games were simpler and didn't need gimmicks to keep gamers playing, and that earns points from me. 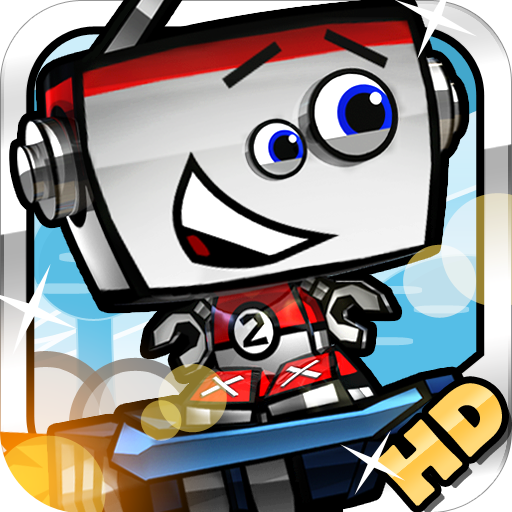 Roboto will come out at an introductory price of $2.99 USD until August 8th, where it'll go up by two bucks to $4.99. If you've got the spare change, I recommend you take a look.